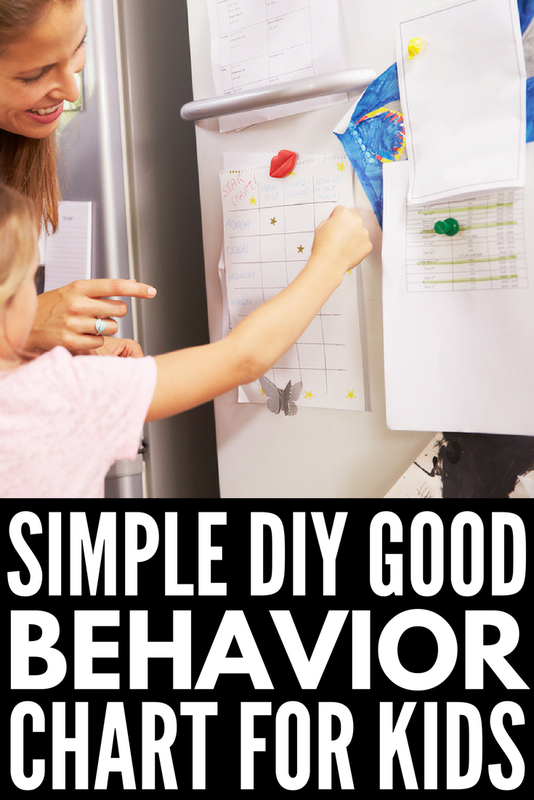 Whether your child is struggling with a specific behavior, or you would like to develop a reward system to help support the positive reinforcement of good behaviors at home and in the classroom, this behavior chart template might be just what you need. 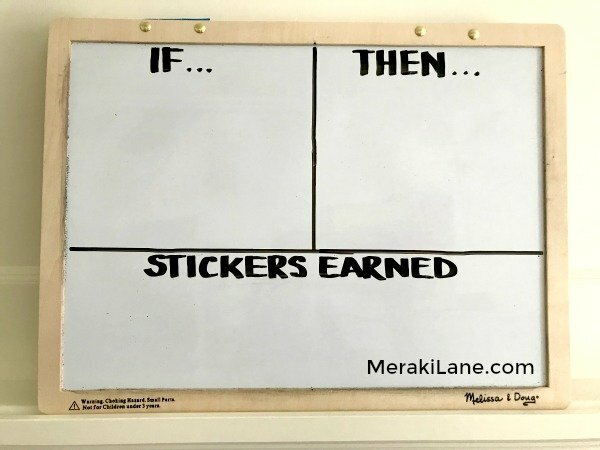 I created this simple good behavior chart for kids by combining 2 different reward systems: a basic sticker chart and a first/then chart. I’m sure this has been created by many parents, teachers, and therapists before me, and take zero credit for the concepts I combined, but wanted to share the idea anyway as it has been such a successful parenting tool for me! Most of us have heard of sticker charts, and the concept is pretty easy. They can be used for a specific behavior (potty training), or as a way to reward overall good behavior throughout the day (using manners, taking turns, etc. ), and each time a child earns a certain number of stickers, a bigger reward is often given to keep the momentum going. First/Then charts are a little different and not everyone is as familiar with them. They offer a visual representation of what you want your child to do now (FIRST) and what will come after (THEN). The idea is to make the first task the behavior you want to work on and to follow it up with an activity your child enjoys, making him or her more motivated to follow through and make long-term behavioral changes. FIRST we get dressed, THEN we play with our toys. FIRST we eat our vegetables, THEN we eat dessert. FIRST we brush our teeth, THEN we get a sticker. FIRST we do our homework, THEN we play with our friends. I’ve had success with both approaches, but find a combination of the two yields the best result when it comes to managing (and changing) behavior. I opted for a magnetic dry erase board with magnets over a piece of cardboard with stickers to create my good behavior chart as I can re-use it over and over and over again, and while you can use any kind of magnets you have lying around the house, I find it extra motivating to choose a character or theme your child enjoys, or magnets with encouraging words printed on them to make it more personalized and exciting. To create my good behavior chart, I wrote ‘IF…’ on the top left and ‘…THEN’ on the top right of my magnetic white board, and drew a vertical line between the two. Towards the bottom of the board, I also wrote the words ‘STICKERS EARNED’. 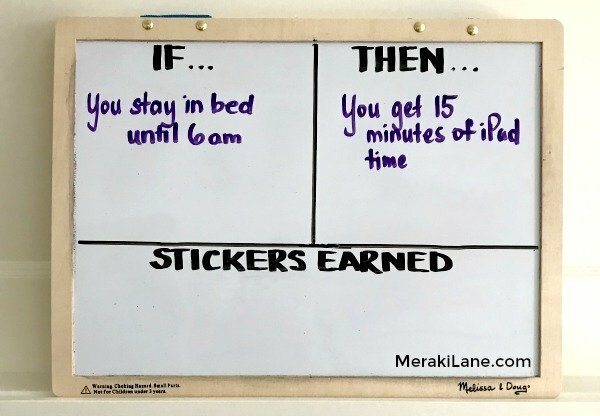 IF you stay in bed until 6 am, THEN you will get 15 minutes of iPad time. 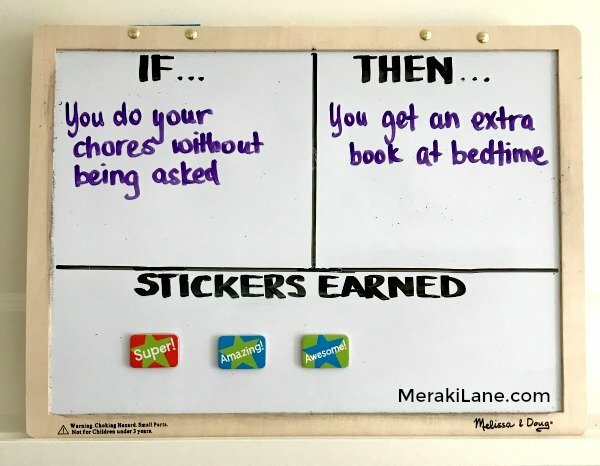 IF you do your chores without being asked, THEN you will get to read an extra book at bedtime. IF you get ready for school on time, THEN we will visit the park after school. Once the behavior has been repeated a certain number of times (I typically use 5 days), we move to a 5-day reward schedule whereby my daughter earns her reward after 5 days of successfully implementing the desired behavior. We usually continue for 1-2 weeks until the concept is mastered, the excitement fizzles, and we want to start working on another behavior. Make sure the behavior you are trying to work on is something your child can achieve, and try not to roll a bunch of different behaviors into one. Keep it as simple as possible to ensure your child will be successful. At the onset, make sure you are rewarding your child soon after the desired behavior is completed to establish a connection between the 2 and keep him or her motivated. Never take stickers away! If a sticker was earned, it is something to be proud of. Do not punish a child by discounting something he or she worked hard to achieve. If your child isn’t successful in earning a sticker for one or 2 days, do not reprimand him or her. Instead, spend some time reviewing the goal of the good behavior chart again and be sure to give reminders throughout the day to encourage success. 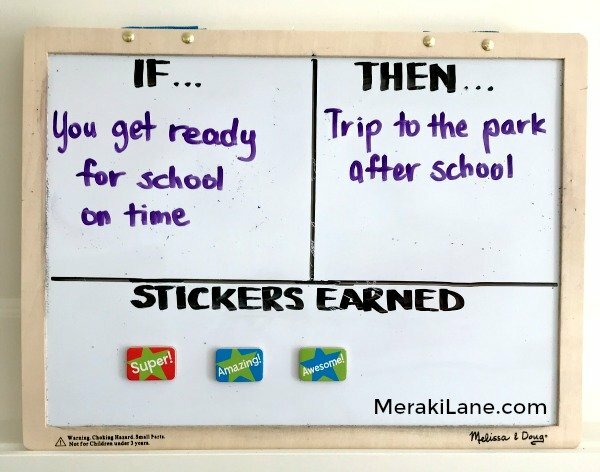 To make things extra-motivating, you can implement a two-tier reward system whereby your child will earn a small reward for each sticker earned (10 minutes of iPad time) and a bigger reward for earning all 5 stickers (a trip to the library, baking a special dessert with mom, etc.). Remember to be patient and have fun! The more positive, motivating, and rewarding you make your good behavior chart, the more successful it will be! If you found this good behavior chart helpful, please share this post on Pinterest!